Africa loses 3 rhino per day. South Africa is home to approximately 80% of the world’s wild rhino, with only an estimated 5000 black rhino and less than 20 000 white rhino remaining. In 2014 the country lost 1215 rhino to poaching. Whilst the number of rhino poached decreased to 1028 in 2017, the species remains under critical threat. Saving the rhino goes beyond just doing the right thing. It extends further than safeguarding a mega-herbivore crucial to building and maintaining the natural ecosystems in which they and other wildlife exist. Protecting the rhino and other keystone species from poachers also means standing up against wildlife crime syndicates that threaten entire ecosystems, sustainable livelihoods and national security. 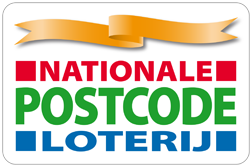 On 4 February 2014, the Dutch Postcode Lottery awarded €14.4 million from its Dream Fund to Peace Parks Foundation and WWF Netherlands to help them in their efforts to save southern Africa’s rhinoceros from extinction. In addition to this, Peace Parks Foundation received €1 million from the Swedish Postcode Lottery to combat rhino poaching. This have allowed us to initiate detailed projects as part of a multifaceted Rhino Protection Programme. The programme is also receiving additional funding and expertise from various charities, non-profit organisations and businesses as Peace Parks engages with increasing numbers of strategic partners to multiply the effect of interventions. We work closely with the South African government and its conservation management authorities, South African National Parks (SANParks) and Ezemvelo KZN Wildlife (Ezemvelo), as well as with Mozambique’s National Administration for Conservation Areas, to develop and implement practical, well-considered methods through which to address issues at various critical points along the so-called ‘poaching supply chain’. 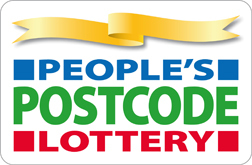 In 2016, Africa’s first wide-area surveillance system, named the Postcode Meerkat in recognition of the support received from the UK People’s Postcode Lottery, was launched in Kruger National Park. South African National Parks, Peace Parks Foundation and the Council for Scientific and Industrial Research (CSIR) partnered to research, develop and manufacture the Meerkat. This innovative system comprises a suite of radar and electro-optic sensors that detect, classify, monitor and track humans moving in the park over a wide area. In addition, the system has been designed to be mobile so that it can be deployed to hot spots where it is needed most. The Postcode Meerkat has significantly increased the park’s ability to protect rhino and other vulnerable species by enhancing the capacity to pinpoint exactly where poachers are, activate rapid response, disrupt or apprehend the poachers, whilst minimizing the threat of unsafe contact between rangers and suspected poachers. Reports confirm that the system is ‘’dominating’’ its area of operation over full moon periods. Traditionally, these are times when poachers are most active making use of the visibility provided by the moonlight. The Postcode Meerkat is ensuring that poachers can no longer take advantage of these conditions and has safeguarded the rhino during this vulnerable time – with zero incursions to the area of operation. Meerkat operations will now aim to expand this success to dominate not only the full moon period but also the dark moon periods. The technology, as an anti-poaching solution, matured considerably in 2017, and two additional enhanced models will be built and deployed in Kruger National Park in 2018. A conceptual framework has identified five distinct levels at which rhino horn trade syndicates are operating within and outside of Africa. The first three levels function nationally. 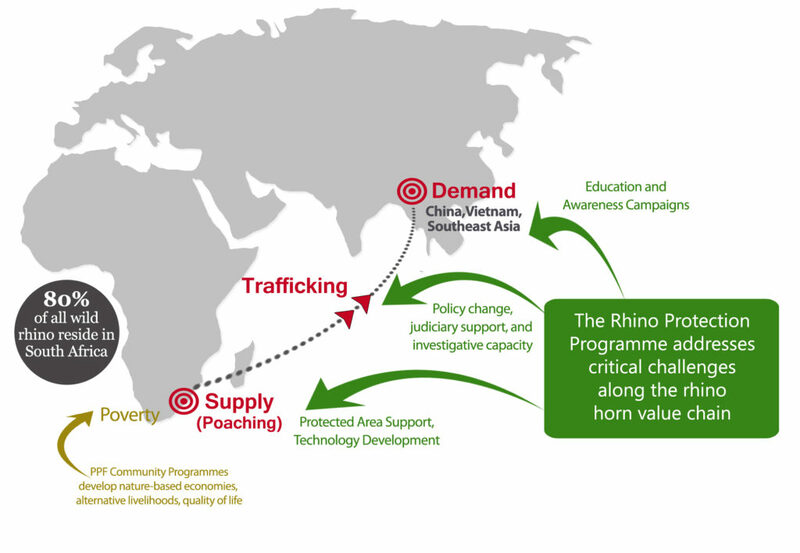 The Level 1 activity represents the illegal killing of an animal, such as rhino or elephant; Level 2 activity represents local buyers and couriers who receive the horns from the poachers; and Level 3 activity represents national couriers, buyers and exporters who consolidate horns from all sources, including poaching, stockpile sales, thefts and illegal dehorning, as well as ‘pseudo-hunting’ activities. Linking Africa to distant markets, Level 4 represents international buyers, exporters, importers and couriers who are then responsible for the movement of horn to rhino horn dealers to the Level 5 activity, which takes place with the consumer in end-use markets. In 2017, the number of Level 2 to Level 4 syndicate members arrested through affiliated operations increased by 83%. This is a significant win for counter-poaching efforts when considering that for every single syndicate member removed from the system at least 60 to 80 poachers are rendered ineffective. Protected area support involves various initiatives that provide staff at the frontlines with the services, infrastructure, equipment and training they need to protect the rhino, safeguard themselves and execute successful counter-poaching operations on the ground. As the region that possesses the rhino population with the farthest reaching genetic pool, the protection of rhino in South Africa’s province of KwaZulu-Natal, through collaboration with Ezemvelo KZN Wildlife, is of critical importance to ensuring the viability of future rhino population growth efforts in South Africa. In collaboration with the South African Police Services and local authorities, training courses on wildlife crime scene management and processing are presented to detectives, prosecutors and Ezemvelo staff on an ongoing basis. Key field staff, who rely on such skills to counter-track illegal entries into rhino reserves, attended micro-tracking and counter-insurgency tracking courses. Ezemvelo is collaborating with the Southern African Wildlife College on a comprehensive training programme for rangers and patrol leaders, which will get under way early in 2016. Advanced repeaters and radio systems have been installed and law enforcement staff in the Ezemvelo rhino reserves have been equipped with new digital two-way radios. The new communication system allows for encrypted, secure communication, with much-improved legibility and reach. Improved gate access control is being implemented across Ezemvelo rhino reserves, to increase surveillance and identification capacity at reserve gates. This information will be used to assist investigations, as well as provide alerts on high-risk visitors and vehicles, thus increasing the chance of known suspects being apprehended when attempting to enter the park. Guard observation towers have been placed at strategic positions in Ezemvelo rhino reserves to allow for the more effective monitoring of high risk entry points and of wildlife. Ezemvelo was assisted in transforming eight law enforcement vehicles by coating them in camouflage green vinyl wrapping. This makes them more effective for covert law enforcement and surveillance activities. Field equipment, including 230 daypack kits and 400 SWAT pepper spray units, were provided to field rangers in support of the law-enforcement operations. A project to develop a central information management and coordination system to collate, visualise and manage data from various sources is progressing well. The system visualises and reports on data coming into the system and is aimed at assisting with increasing effectiveness of patrol planning and deployment, in conjunction with rhino population management. We work closely with Mozambique’s National Administration for Conservation Areas (ANAC) to enhance protection operations in Limpopo National Park. To this end PPF recently mobilised additional funding amounting to more than $4.5 million to help bolster anti-poaching efforts in the park. This is over and above an approximate $1.0 million already allocated by the Foundation to the development and operations of the park for the period 2014-2018. 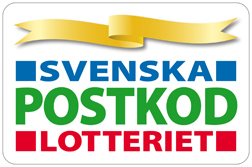 The financial support is made possible through the generous support of the Dutch and Swedish Postcode Lotteries, KfW, the French Development Agency, MozBio, and other private donors. 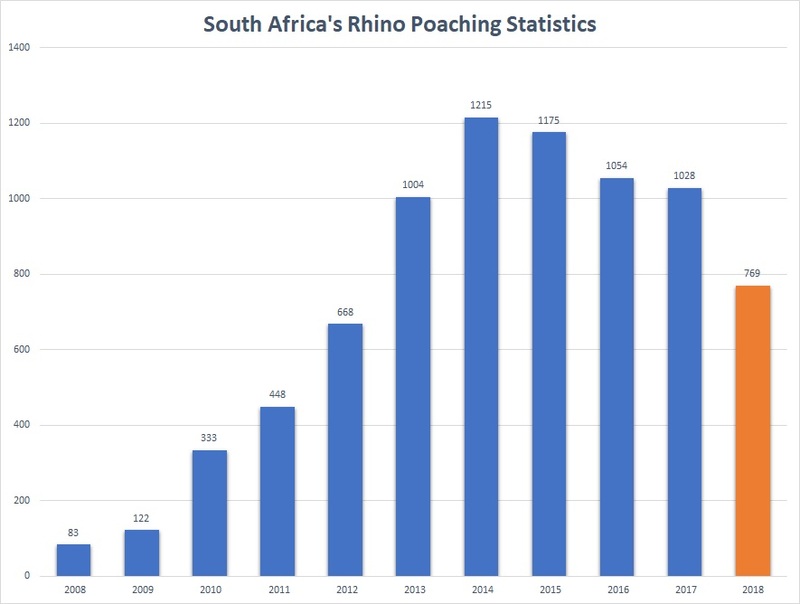 By facilitating effective collaboration between Mozambique and South Africa, and assisting the government of Mozambique in elevating counter-poaching capacity on the ground, there has been a clear decrease in poaching incidents that originate from Mozambique’s shared border with Kruger National Park. A core focus is to establish an expanded Intensive Protection Zone (IPZ) in the Park. With more than one million hectares to patrol, implementing effective anti-poaching strategies throughout the expanse of the Park remains a significant challenge. The IPZ strategy allocates 80% of anti-poaching resources to the protection of vital hotspots identified along the park’s western border – a boundary shared with Kruger National Park, and the section of Limpopo National Park with the largest concentration of game. This area remains a critical focus point for illegal activities of wildlife crime syndicates. To strengthen impact in the Intensive Protection Zone, senior operational and technical staff have been appointed to lead the development of tactical strategies in the Park. Ad additional 29 new rangers were trained and employed and ranger activities are now coordinated from a new mobile field operation base supported by a helicopter that is greatly increasing ranger mobility. The new central command centre has been equipped with the latest technology systems, which also connects with the Park’s new digital radio network. Another helicopter and additional operation unit will be deployed in the park within the coming weeks. In addition, funding is used to cover the operational costs of a dedicated aircraft operating in the IPZ; provide advanced field training; operate a ranger incentive scheme; as well as equip rangers with vital patrol gear. Purchasing a brand new Savannah S Light Sport Aircraft with which to augment aerial counter-poaching and wildlife monitoring activities. Installing a new and advanced digital communication system was recently concluded. The system uses the latest technology and has a number of features that includes alarms to ensure system security and integrity. It also includes position monitoring, to improve the safety and operational capability of the field ranger unit. Furthermore, with the construction of a new repeater station located on the border between the two parks, the system enables cross-border communications between Limpopo and Kruger national parks as part of collaborative anti-poaching operations. Field rangers received various consignments of equipment that included patrol backpacks with kit, patrol bicycle spares, raincoats, spotlights, solar powered torches, GPS units, phones, as well as computers, printers, appliances and furniture aimed at appropriately equipping new ranger living quarters and offices. More than 100 counter-poaching staff received guard and field ranger training, in association with the Southern African Wildlife College. Senior field rangers received training in the Spatial Monitoring and Reporting Tool (SMART). Following an increase in wildlife poisoning in Great Limpopo Transfrontier Park, Limpopo National Park staff received poisoning awareness training. At Mapai, Machampane and Massingir gates, roads were improved and access control upgraded. Infrastructure and facilities were upgraded at Mapai and Gaza base camps. A new field ranger base was constructed at Massinger. To ensure that the core wilderness zone is fully protected, a voluntary resettlement programme by the Mozambican government is under way. This entails relocating 1 800 households from eight villages in the park. Mozambique remains an important transit route for rhino horn and other wildlife products, such as ivory, from southern African countries. Through the Rhino Protection Programme, Peace Parks Foundation remains committed to its partnership with Mozambique’s National Administration of Conservation Areas (ANAC) to work towards combatting poaching and trafficking in the region. 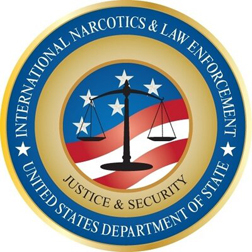 To this end, Peace Parks and ANAC entered into an agreement whereby additional support was provided to focus on interventions to counter organised crime and trafficking through ANAC’s Department of Protection and Law Enforcement (DPLE). Peace Parks Foundation and WWF-Netherlands jointly supported the founding of the Wildlife Justice Commission, which has grown and evolved into a robust organisation that is committed to disrupting transnational, organised wildlife crime by exposing criminal networks and the corruption that enables them to flourish by empowering – or if need be, pressuring – governments to enforce the law. The Wildlife Justice Commission has a large complement of dedicated professionals and through this team they have initiated numerous investigations and national dialogue efforts in several countries. Investigations and efforts to initiate national dialogue regarding the illegal trade in wildlife are being pursued in Laos, Vietnam, Mozambique, South Africa, Malaysia and India. Investigations and operations driven by the commission have resulted in the arrest and conviction of numerous traffickers and the seizure of large quantities of rhino horns, ivory, lion and leopard products as well as semi-precious stones. Although trading rhino horn has been illegal in China since 1993, the prohibited activity remains widespread in the country and is fuelled by the continuous flow of rhino horn coming in across the border from Vietnam. Over the last two years, in partnership with South African non-profit organisation Peace Parks Foundation, students from the College of Design and Innovation at Tongji University in Shanghai have been using their skills and learning process to develop design concepts or products which address the complex issue of rhino horn use in Asia. In its courses, the College seeks to address global challenges by cultivating future leaders in sustainable design and innovation who can contribute to social development and change while pursuing academic excellence. The students have delivered professional marketing pitches with consumer-tested and skilfully designed products. They took to the streets, shopping centres and schools of Shanghai to test their designs and, at the same time, educate their communities about the plight of the rhino by means of video games, participatory drawing activities, 3D-rhino puzzles, and interactive rhino figurines. The top performing team for 2017 produced a professionally designed rhino-branded anti-pollution breathing mask that, in its functionality, also symbolises the connection between the need for environmental vigilance for both animals and humans. For many years, access to rhino protection and partnerships to combat wildlife crime has been incredibly difficult to achieve in China, and for this reason, the Tongji connection has been a significant step towards building effective and sustainable relationships in the country. In 2018 the project also expanded to Tshingua University in Beijing. Representatives from the teams who present the most innovative and marketable ideas are brought to South Africa by Peace Parks Foundation for their first glimpse of rhino in the wild. The aim is to provide them with enhanced insight and revitalised inspiration for the final refinement of their designs. They also get the opportunity to exchange ideas with experts in the local conservation industry so as to pave the way for impactful, real-world implementation of their concepts. Wilderness Foundation Africa, in partnership with Peace Parks Foundation, SOUL Music & Performing Arts Academy, and recently also supported by the Olsen Animal Trust, implemented the Wild Rhino demand reduction campaign that aims to educate and engage Vietnamese youth on the issue of rhino poaching. The project has three integrated components; the Wild Rhino Competition, the Youth Ambassador Awareness and Education Campaign, and the Rhino Ranger Super Hero Campaign. Since the 2014 launch of the first Wild Rhino Competition in 11 participating private/international schools in Ho Chi Minh City, the campaign has reached about 25 000 Vietnamese youth directly, and nearly 1 million youth indirectly, through campaign and youth ambassador social media activities. As from 2018, the campaign has also rolled out to two schools in Hanoi. The Wild Rhino Competition invites the youth to engage with the topic of rhino protection through drawings and essays. Winners of the senior essay competition are then brought to South Africa to learn about rhino, conservation and species protection first-hand. Besides attending the wilderness trail, the students spent time with rhino calves orphaned as a result of poaching, and also participated in educational workshops facilitated by the Wilderness Foundation. Inspired by what they experienced and learnt, these young people then return to Vietnam as true Rhino Youth Ambassadors for the cause. The Vietnam, be my hero youth ambassador component calls on these young Vietnamese to be superheroes and speak out against the use of rhino horn. It involves professional visual education messaging presented on a variety of posters, decals, leaflets and associated materials that is distributed and installed throughout the schools, at events, in printed publications, on the project web site, and continuously pushed on social media. The campaign is built on the premise of peer-education and engagement, and the Rhino Youth Ambassadors play a leading role as role models and faces of the campaign – speak first-hand about the pertinent issues and offering credible and age-appropriate messaging to the campaign. The campaign roll-out and activities are coordinated from a local project office established in Ho Chi Minh City in 2015. The Rhino Ranger campaign mascot serves as an age-appropriate conduit through which to deliver demand reduction messaging to Vietnamese youth using his own comic strip, comic book, action figure and social media campaigns. Rhino Ranger visits schools and reaches out to the youth during through various interactive activities. Two editions of the Rhino Ranger Comic book has been launched and can be downloaded online. In order to reach an even younger audience, a rhino and conservation education activity and colouring book was launched in 2018. TRAFFIC, the wildlife-trade monitoring network, and the World Wildlife Fund are tackling the demand for rhino horn in Vietnam through consumer behavioural change initiatives. The Chi campaign aims to reduce demand for rhino horn amongst the members of the business community in Vietnam, who consume rhino horn to demonstrate success and social status. The campaign has reached more than 10 000 businesspeople across 45 Vietnamese cities and provinces have gained the tools and methods to adopt corporate social responsibility policies that incorporate wildlife protection. TRAFFIC has assisted the Vietnam Chamber of Commerce and Industry to present over 240 courses to reach members of the business community. Peace Parks Foundation’s support, in collaboration with WWF Netherlands, has been vital for the successful scale-up and roll-out of this campaign. Peace Parks Foundation has partnered with Laureus Sport for Good Foundation to develop an integrated youth programme to broaden the perspective of young people living in and adjacent to the Great Limpopo Transfrontier Conservation Area (GLTFCA), with a specific focus youth from impoverished communities in Mozambique. Hlawula Vutomi (Shangaan for ‘Choose Life’) is a recognition that choosing life is achieved through the coexistence of people and the planet. The programme promotes dignity and hope through the provision of real opportunities in the areas of personal growth, skills development and social cohesion. Sport, information technology, life skills through conservation, and networking are the primary learning tools applied. Young people hold the key to a sustainable and peaceful future and this programme is a proactive measure to shape tomorrow’s leaders. The RPP assisted Ezemvelo KZN Wildlife – who had identified community support as a crucial component of rhino protection – to implement an anti-poaching awareness campaign across its reserves. All campaign materials, which include brochures, posters, banners, banner walls and taxi/car stickers, are available in English and Zulu, and placed at high-volume public places such as along main roads, in reception areas and at taxi ranks. The leaflets provide information about the rhino-poaching problem and its extent, the importance of rhino to the environment and to the economy, and how community members can assist. To further community interaction, a dedicated anti-poaching hotline was created and the number, with details of how to assist, features prominently on all materials. At any given time, there are approximately 10-15 rhino orphans being cared for by Ezemvelo KZN Wildlife, and 20-30 rhino orphans in the care of Kruger National Park. Whereas at the start of the current rhino poaching crisis, rhino orphan care was regarded as only a small sub-section of rhino counter-poaching efforts, it has now become one of the primary focus areas of conservation agencies – recognised as a component that is vital to long-term rhino re-population efforts. The Rhino Protection Programme has provided Kruger National Park and Ezemvelo KZN Wildlife with the means to strengthen the capacity of key wildlife veterinary teams – to enable them to treat the rhino that survive brutal attacks by poachers, as well as provide resources for the rescue, care, rehabilitation and release of the ever-increasing number of rhino orphans. This included providing emergency response (helicopters/trucks/equipment), medical supplies and food. In addition, research into best practices for rhino orphan nurturing and rehabilitation was supported. The resources provided by the Rhino Protection Programme also assisted veterinary staff in processing crime scenes for the purposes of DNA processing, evidence collection, forensic analysis and veterinary research. Both SANParks and Ezemvelo are not taking in the same number of orphaned rhino as they were at the height of the crisis and while protecting individuals that will be reintegrated to contribute to South Africa’s highly threatened rhino meta-population is a priority, the funding provided by the Rhino Protection Programme is now nearing completion and PPF has chosen to direct the remaining limited funding to interventions that will impact poaching and ultimately eliminate the need for orphaned rhino care. The collection and management of rhino DNA samples – specifically for criminal tracing and prosecution purposes – is an essential service provided by the Veterinary Genetics Laboratory at the Department of Veterinary Sciences of the University of Pretoria, which maintains the national rhino DNA database (RhODIS). The Rhino Protection Programme provided funding to support the development of the eRhODIS application – a digital solution intended to simplify the collection of DNA data from the field for real-time input to RhODIS. The programme also provided resources to enable the training of veterinarians, investigation officers and members of the South African Police Force in the use of the application and device. Thanks to Rhino Protection Programme’s support, a backlog of thousands of DNA samples was cleared. One component of the Rhino Protection Programme’s comprehensive approach involved investigating methods of pro-actively devaluing the asset – the rhino horn – so as to reduce its consumptive value, and demotivate poaching activities by creating risks that outweigh the rewards for criminal syndicates. After concluding investigations into the possible chemical alteration of rhino horn, it was deduced that this was not a viable option. Within the current environment where it is required to “Act Now”, and with no concept of the length of time it would take to develop sustainable and replicable chemical alteration solutions on the scale required by the large conservation agencies such as Ezemvelo KZN Wildlife and South African National Parks, resources would be better spent on initiatives that add immediate value to the counter-poaching activities on the ground. In partnership with the Nuclear Energy Council of South Africa (NECSA), we engaged in the analysis of rhino horn with the objective of applying controlled irradiation to rhino horns to create a detectable radioactive signature tag on the horn. Findings are being compiled for presentation to the South African nuclear regulating authority. After several attempts to conclude the horn irradiation tests and eliminate the causes of the high exposure readings generated by the neutron activator, a decision was reached to close out this horn devaluation research project. It was determined that, the rhino horns could indeed be radiated but not without potentially affecting the safety of the animal. In particular, the initial radiation levels were too high and if the exposure was reduced to safer levels it meant that the horns were not able to retain the radio-active signature. It was reasoned that without a definite indication that a solution can be found it is not feasible within the remaining timeframe and budget for the RPP to continue with the research. Although the overall objective to create a detectable “radioactive” signature tag on the horn was not been realised, the research information acquired through the project will make valuable contribution to the current body of knowledge on the chemical and elemental composition of rhino horn. A decision will be reached with NECSA on how best to share the research information.